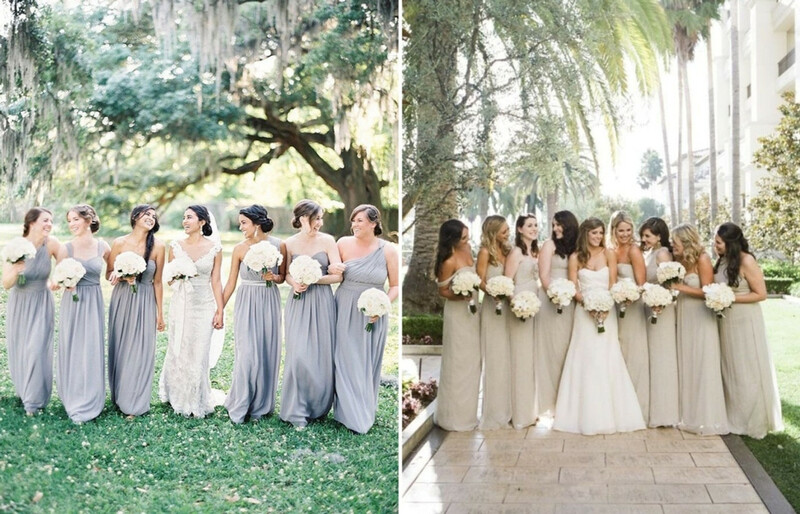 Aside from mismatched wedding rings, there is actually one other thing that you can play mix and match with— your bridesmaids' dresses. Even though you can get creative and experimental with the bridal party's attire, there are still some rules to adhere to so that your bridesmaid array doesn't seem like random uncoordinated guests you just picked out on that day. Have your bridesmaids wear the same colored attires, while allowing different styles according to their preference. Thus their own personality shine through, with them looking unified as a team. Get the same base material for each bridesmaid; be it lace, stripes, printed fabric, floral— you name it. Again, let them have their own say in what kind of style they wish to wear. You’ll be surprised at how lovely they look for your big day. This one might be a little tricky, but still doable. 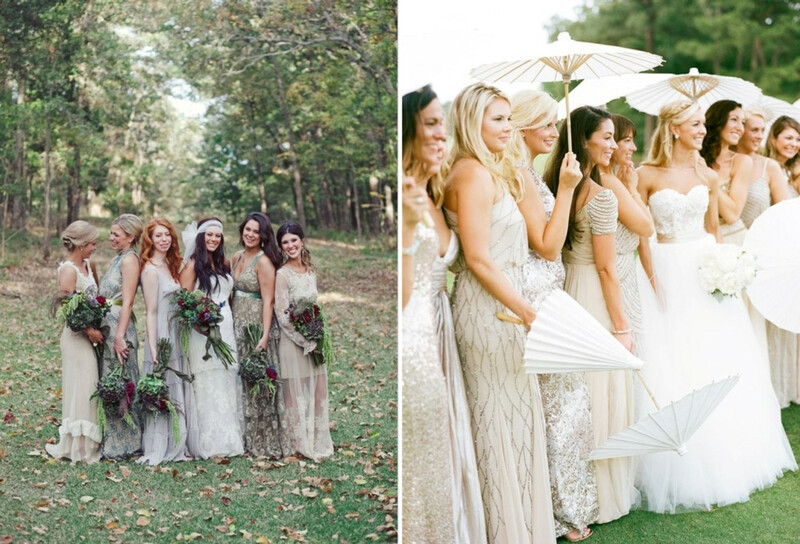 Assign a theme to your bridesmaids, one that aligns with your wedding theme. Say, the roaring 20’s or swinging 60’s; and let them do their own thing. You can also provide some color or mood guidelines so that your bridesmaids don’t go off track with the dresses and accessories they pick. This one is a little bit easier to pull off. 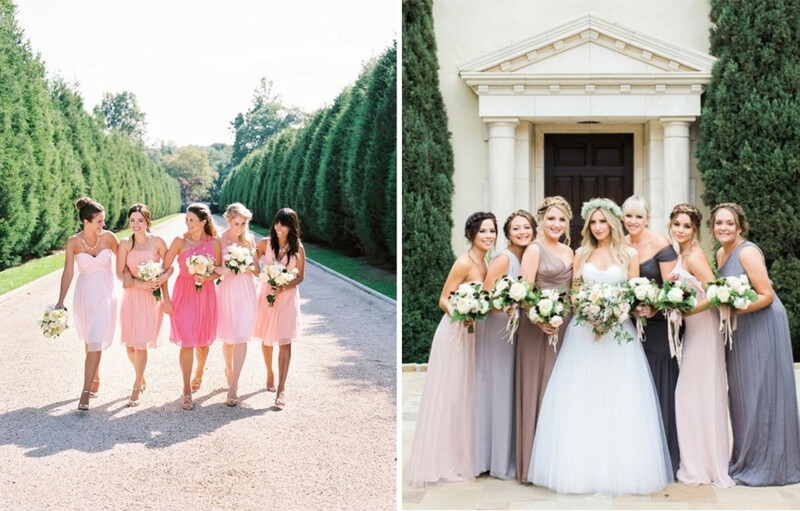 Play with colors in your wedding palette and match them with the bridesmaid dresses. You can play with lighter and darker shades of the color or simply have them wear contrasting colored dresses that surprisingly go well together. The latter is trickier so make sure that the colors do blend nicely by sight and not only in your head. 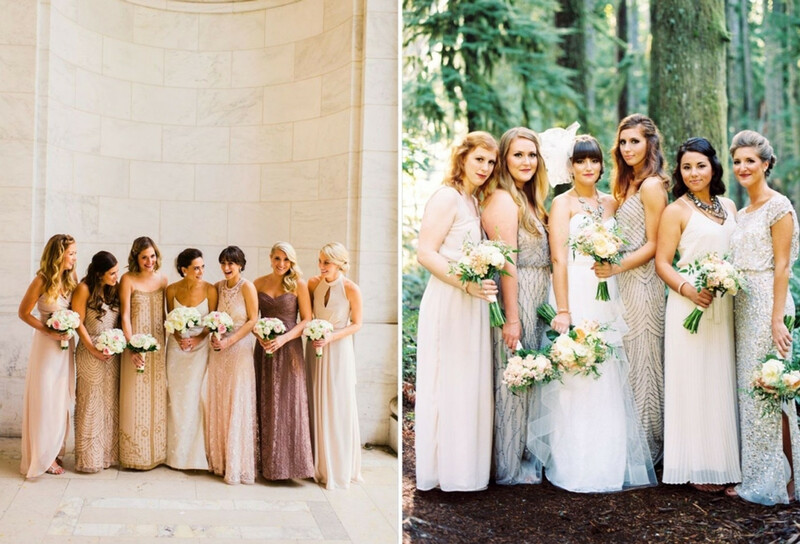 These arrays of bridesmaids have it all; sequins, different colors and accessories, different dress style and materials yet still they pulled things off nicely. The key to this is to opt for a muted or neutral palette so that the colors go well together.